focuses on the works of Kim Wolsik, Motoyuki Shitamichi, Unmake Lab, Lee Dongwook and Choi, je hun, whose artwork occupy varying contents and contexts, and examines their works in the frame of the “makeshift.” Imsibyeontong (臨時變通), the Korean word for “makeshift,” originates from the art of war, and refers to a temporary, adaptable remedy for a sudden, unexpected disaster. However, as we are doubtlessly aware from our daily lives and experiences, every invention and mass-produced product throughout history began with a temporary and adaptable prototype, and these makeshift products became the starting point for things that endure for a long time, even to the point of being immortalized. Above all, when examining artistic practices as a makeshift, the said starting point has earned its right to be preserved, and this makeshift embodies the artist’s method and attitude in responding to and reflecting upon everyday experiences and creative activities. Their creative activities show that a makeshift product is not the final result, but a journey to follow its implied meaning and purpose. Furthermore, the exhibition space constantly demands the exhibition curator to work in a makeshift way, and constitutes a space that is only available during the exhibition period. 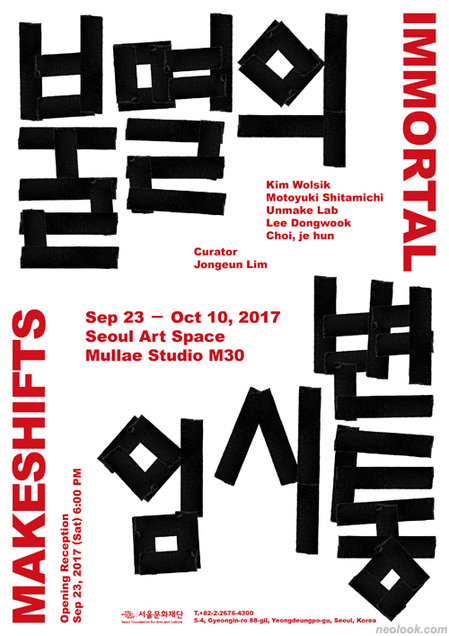 Seoul Art Space Mullae Studio M30, where the exhibition is to be held, is not a sterile white cube but a factory-like space. It represents a borderline space and playground for imagination where the same place is turned into an exhibition hall through works of art and transformed back into an ordinary space.